Designer Dog Bandanas Sold on Amazon | Bark.Bark.Goose. Don't you want your best friend to look nice? We think you should. A dog bandana will do the trick! Welcome to Bark.Bark.Goose. dog bandanas. Our hand made bandanas are sold exclusively on Amazon and if you order with Prime, you’ll get two-day free shipping! Sizing questions? Here you go! Our VAN LIFE dog bandanas are perfect for summer camping season! 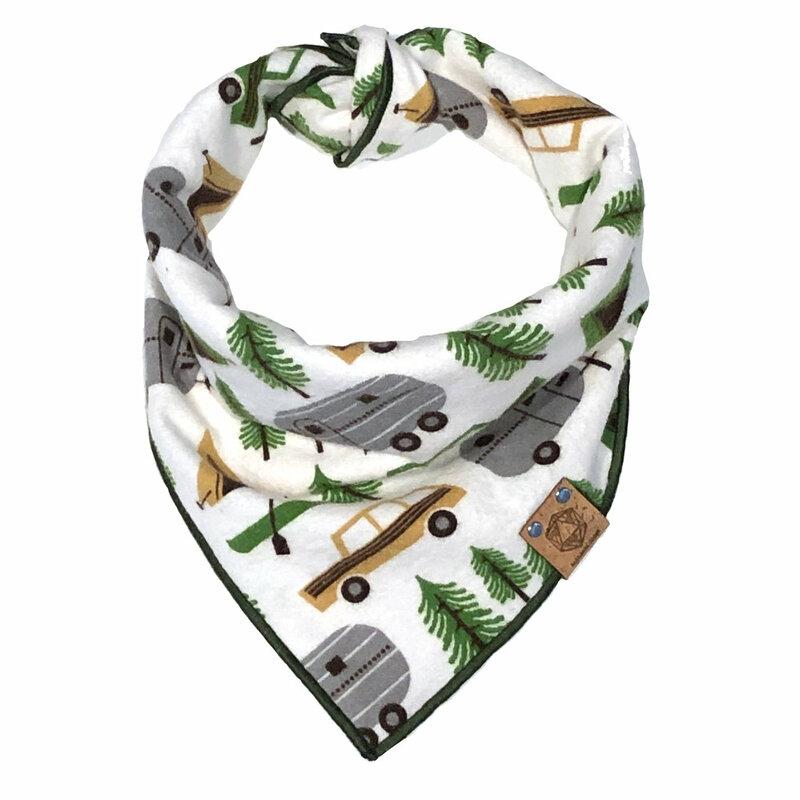 Made of soft flannel with the tiniest stretch, this white, brown, and green dog bandana will make your furry friend look super festive on your summer road trip. 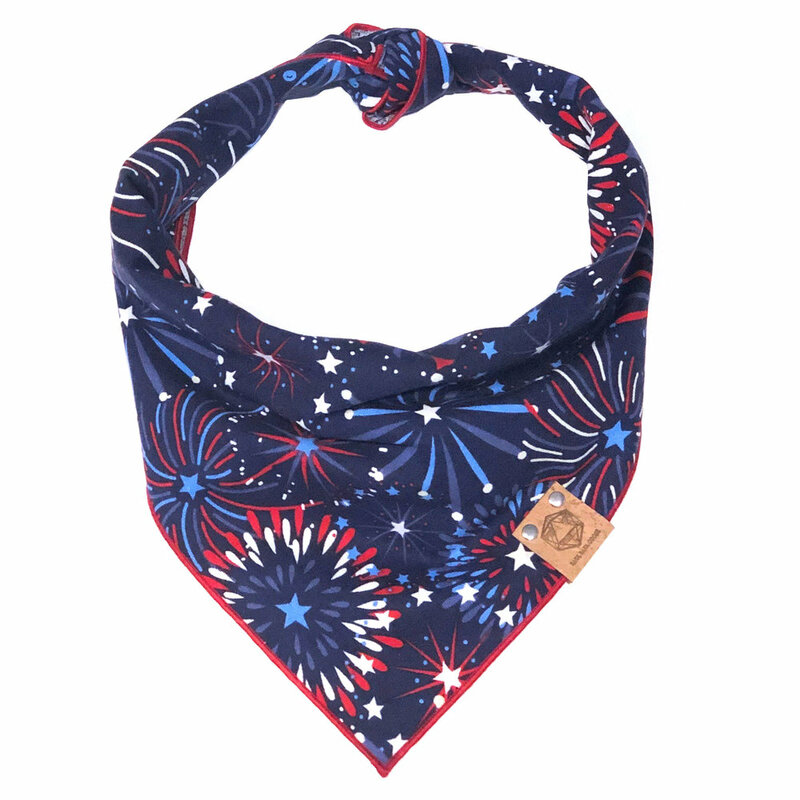 Our FIREWORKS dog bandanas are perfect for the summer -- and especially Memorial Day, the Fourth of July, and Labor Day! This red, white, and blue dog bandana will make your furry friend look super festive at your summer BBQs! Our INDEPENDENCE DAY dog bandanas are perfect for the summer -- and especially Memorial Day, the Fourth of July, and Labor Day! This red. white, and blue dog bandana will make your furry friend look super festive at the block party! Our WHITE STARS SPANGLED bandana is perfect for the summer holidays! With a white background, blue and red stars, and red trim, this is your 4th of July go-to! Our DESERT ROSE dog bandanas are EXTREMELY limited edition and will sell fast! They're 100% organic cotton and just so chic for summer. Our JELLY BEAN dog bandanas are perfect for Easter and the entire spring season! 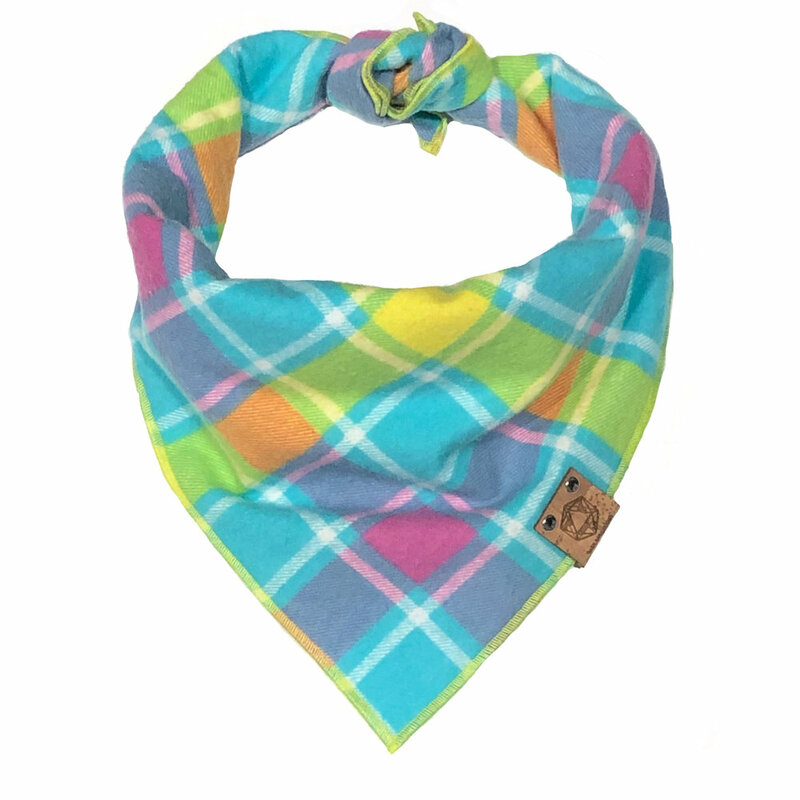 Made of soft flannel, this pink, purple, blue, yellow, and green dog bandana will make your furry friend look super festive at the Easter egg hunt! Our KISS ME, I'M IRISH dog bandanas are perfect for S. Patrick’s Day! 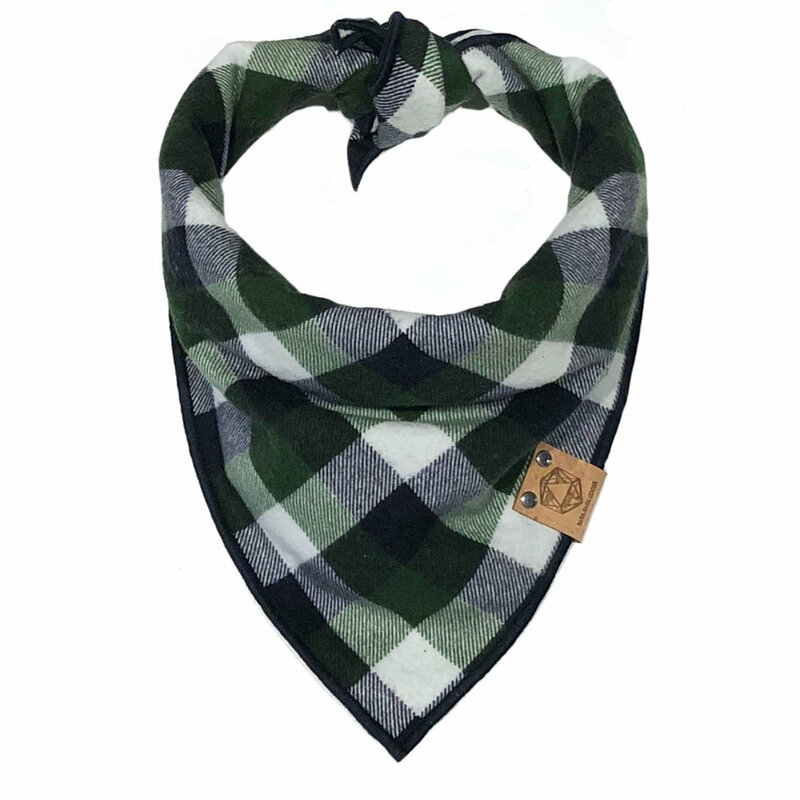 Made of soft flannel in a chic plaid pattern, this kelly green, grey, and white dog bandana will make your furry friend look super festive this St. Patty's Day. Our FOUR LEAF CLOVER dog bandanas are perfect for St. Patrick’s Day! Made of soft cotton in a fun watercolor shamrock pattern, this green and black colored dog bandana is perfect for St Patty’s day parades!. Our LAKES AND FOREST dog bandanas are perfect for St Patrick’s Day -- and the entire winter season! Made of soft flannel, this green, navy, and cream dog bandana will make your furry friend look super fashionable this St. Patrick's Day! Our LODGE HIVER dog bandanas are the perfect mix of St Patrick’s Day and year-round style. Made of soft cotton with the tiniest stretch and in a fun plaid pattern, this green, rose, and cream bandana will give your furry friend the luck o the Irish. WHITE SHAMROCK DOG BANDANA - SOLD OUT! 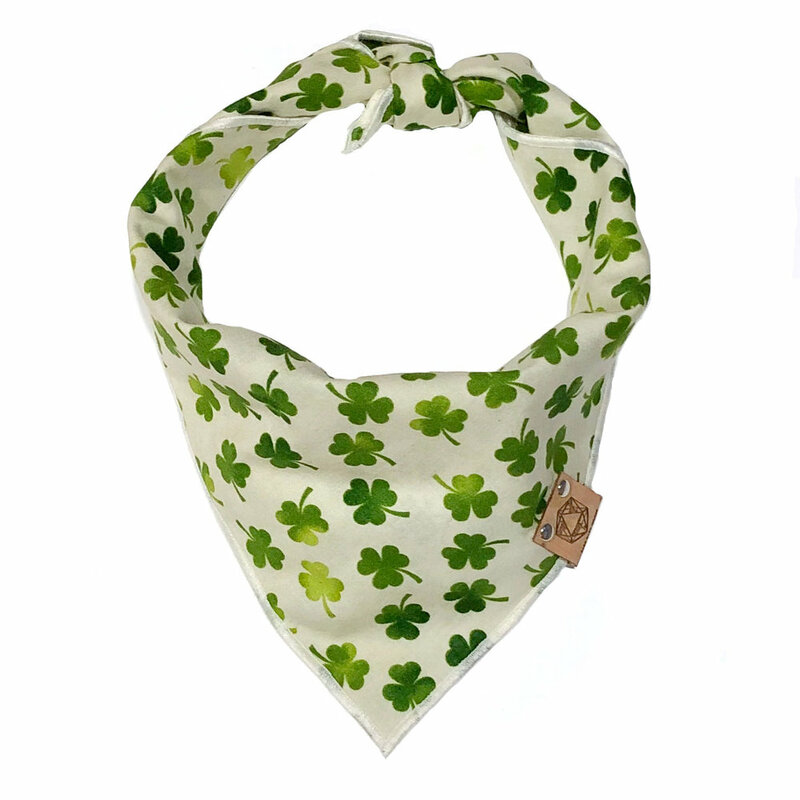 Our LUCKY CHARM dog bandanas are perfect for St Patrick’s Day! These cotton bandanas are in a fun watercolor shamrock pattern with a cream colored background and are perfect for the Irish holiday. 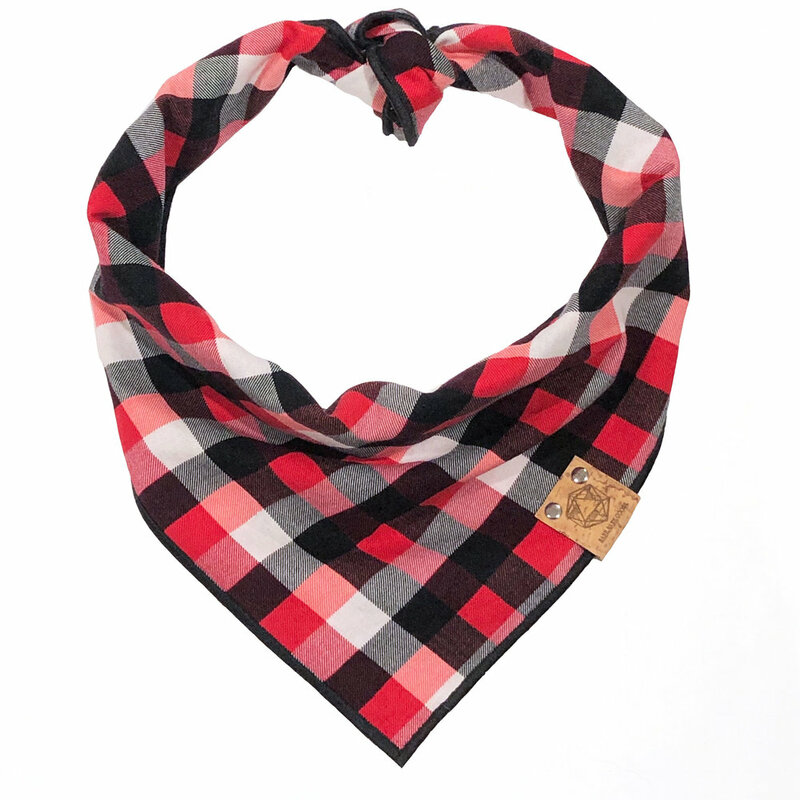 Our LUMBERJACK dog bandanas are perfect for Valentine's Day for boy OR girl dogs! This soft cotton red, black, and white dog bandana will make your furry friend look super outdoorsy all winter long. Our FLURRY IN ROUGE dog bandanas are perfect for the entire winter season -- and especially Valentine’s Day! Made of soft red flannel with the tiniest bit of stretch, this festive dog bandana is covered in white snowflakes of all sizes and shapes. Our LA VIE EN ROSE dog bandanas are perfect for Valentine’s Day -- and are our favorite of all thew new holiday patterns! Made of soft flannel this fuchsia, pink, and berry dog bandana will make your furry friend look super fashionable. 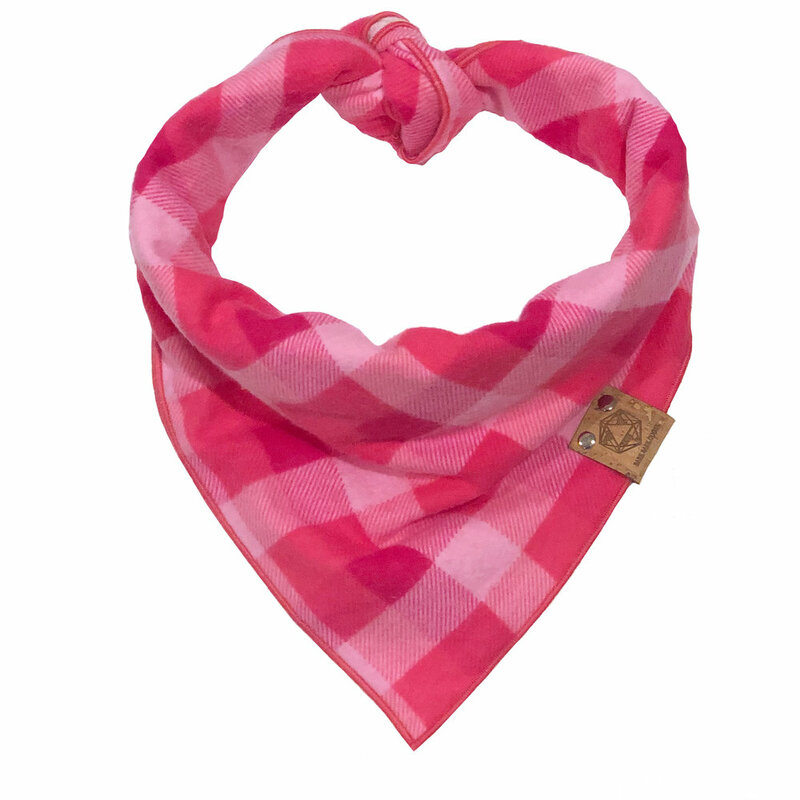 Our PRETTY IN PINK dog bandanas are perfect for Valentine’s Day! 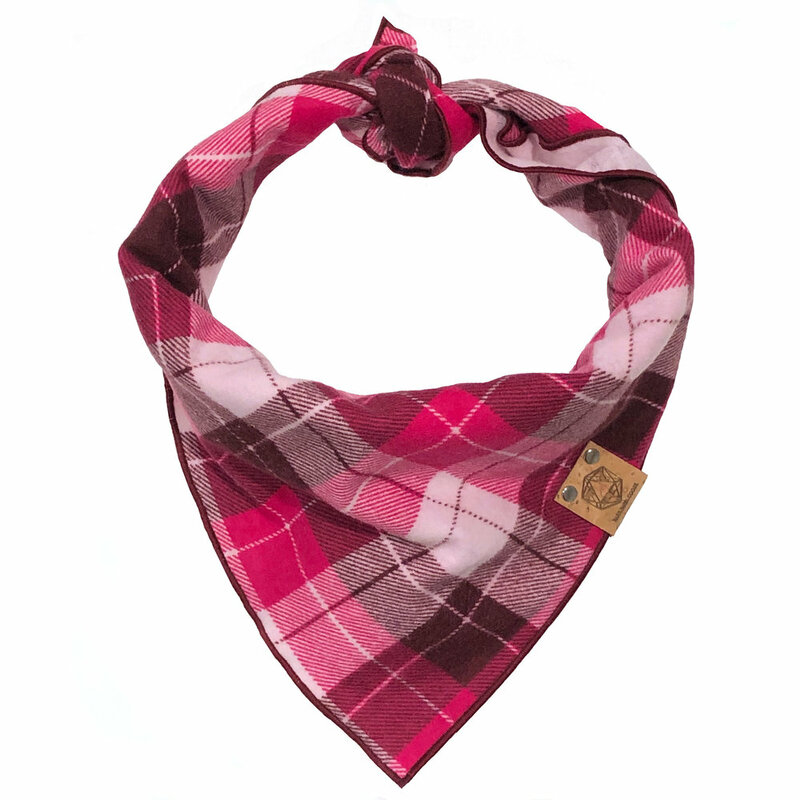 Made of soft and snuggly flannel in a fun plaid pattern, this varying shades of bright pink dog bandana is the perfect addition to your V--Day photos. 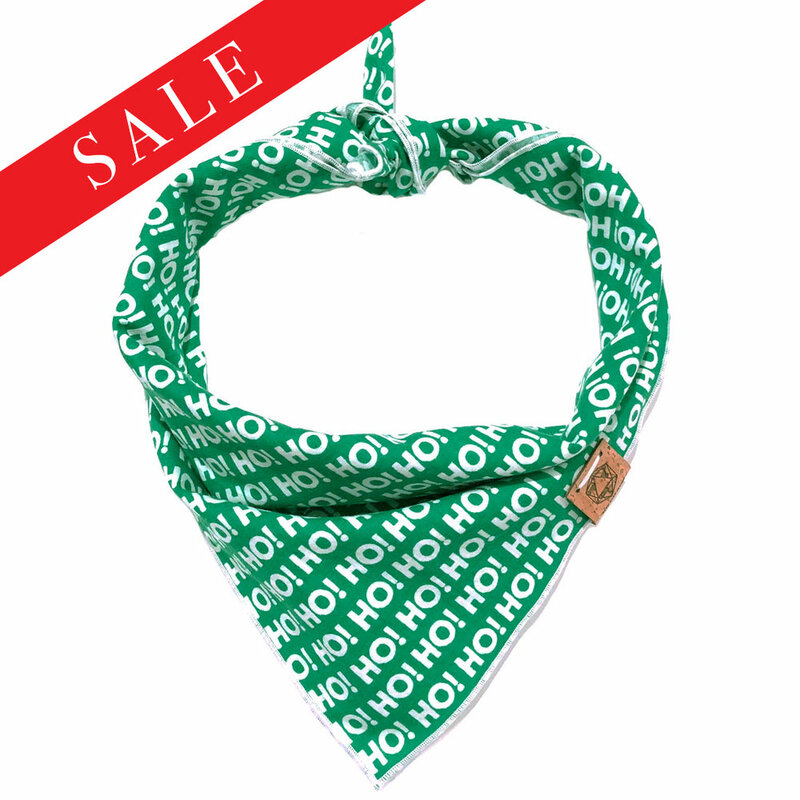 Our HO HOH HO dog bandanas are perfect for Christmas! Made of soft cotton with the tiniest stretch, this white and green dog bandana will make your furry friend so jolly. 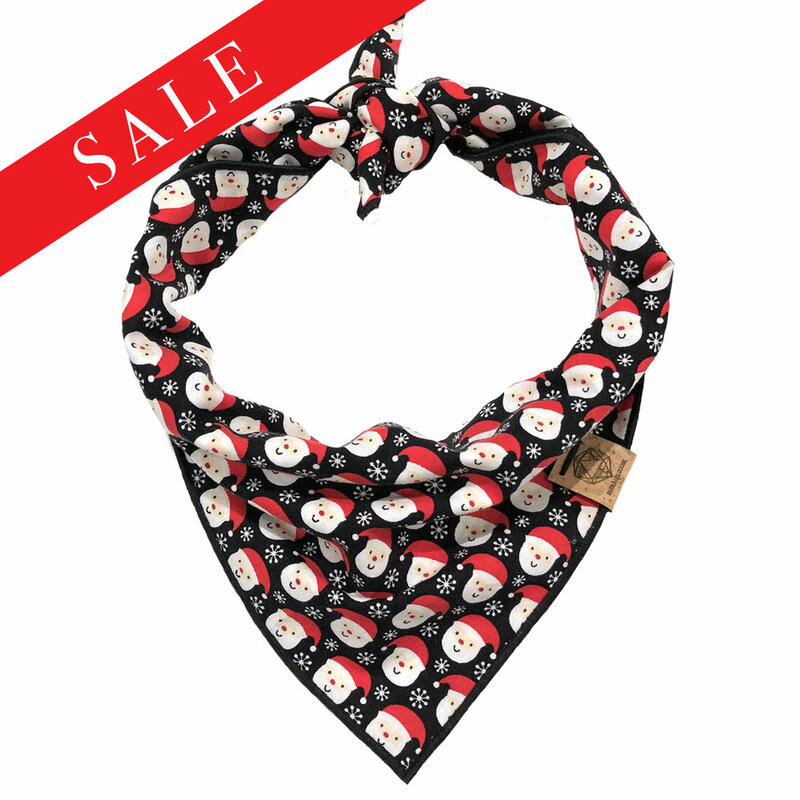 Our KRIS KRINGLE bandanas are made of soft cotton with the tiniest stretch. This Santa head print is set on a black background and will look so cute the entire holiday season! Our PEPPERMINT PATTY dog bandanas are perfect for Christmas! Made of soft cotton in a fun striped pattern that looks like a peppermint candy cane, this red and white dog bandana will make your furry friend look super festive this holiday season! CHRISTMAS DOG BANDANA - SOLD OUT! Our WINTER WONDERLAND dog bandanas are perfect for Christmas -- and the entire winter season! This red, off-white, and green pattern will make your furry friend look super festive all winter long. TASTY TURKEY DOG BANDANA - SOLD OUT! 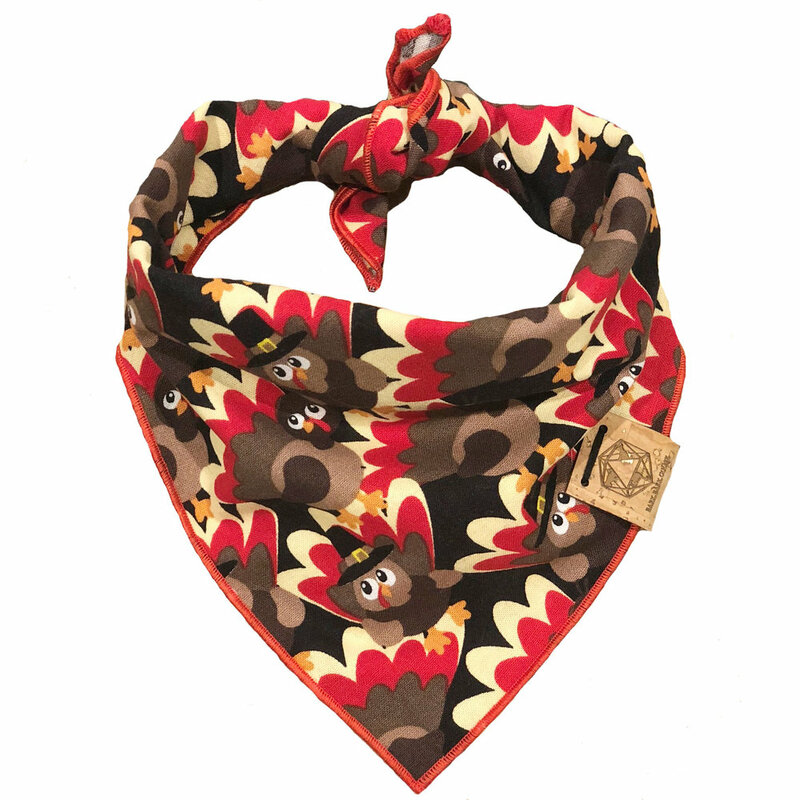 Our TASTY TURKEYS dog bandana is made of soft cotton with silly-faced turkeys wearing pilgrim hats in shades of red, orange, cream, and brown. It’s perfect for Thanksgiving! 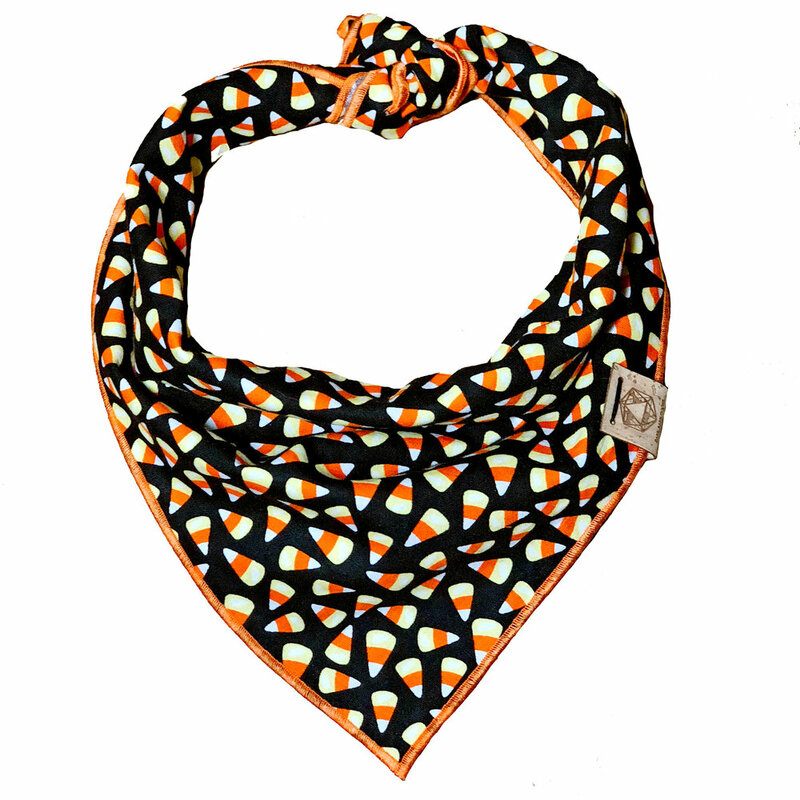 Our CANDY CORN dog bandanas are perfect for Halloween! It’s printed on a soft, black cotton with traditional candy corns in white, yellow, and orange. 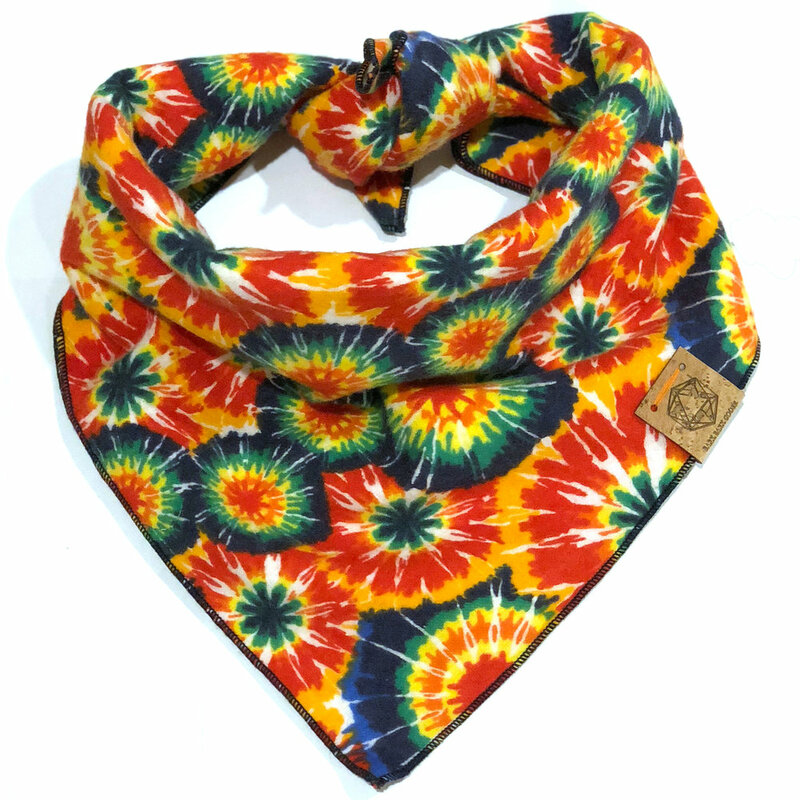 Our WILD THANG bandana has a 1960s inspired print that combines all the colors of the rainbow in a psychedelic pattern. Our OH SO SUCCULENT dog bandanas are made with a thick cotton that will hold their form. It's lively, inviting, and feels just as fresh as spring. 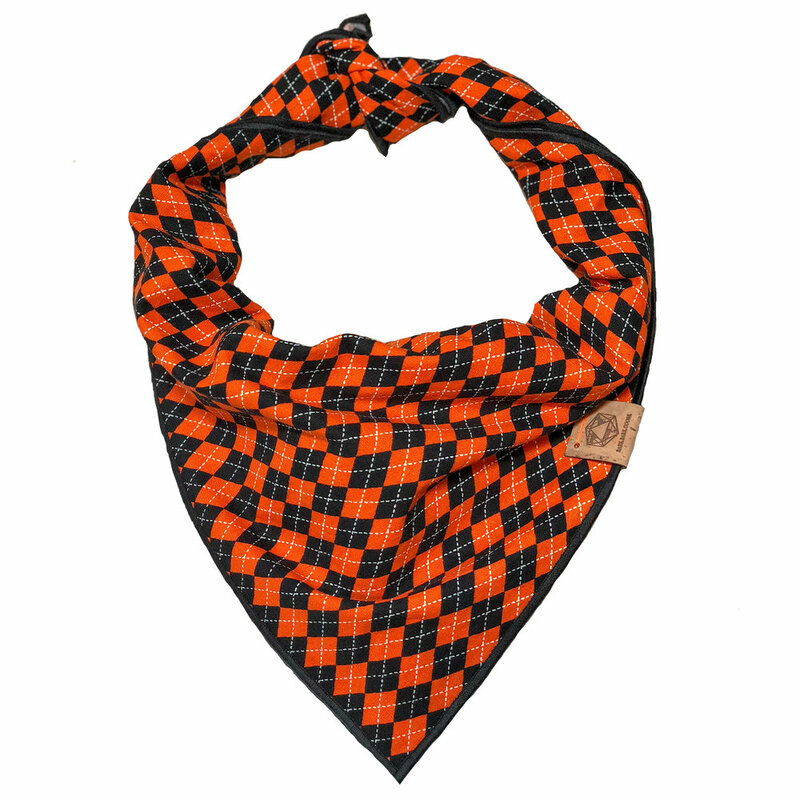 Our PUMPKIN PATCH plaid dog bandana is made of super soft cotton that will look super festive on Halloween and continue to look cute through all of fall! Our CORAL REEF dog bandana is made for dogs and humans that love the sea. This flannel blue and green aztec print is nature-ready! Our SOUTHWESTERN SUNSET dog bandana is perfect for summer! With shades of teal, blue, purple, red, and orange, it mimics a sunset we all remember. Our AMERICANA dog bandanas are the perfect Fourth of July print! It combines red, white, and blue in a fun plaid that is summer-ready. Our WATERCOLOR WATERMELON dog bandanas are cotton and colorful! 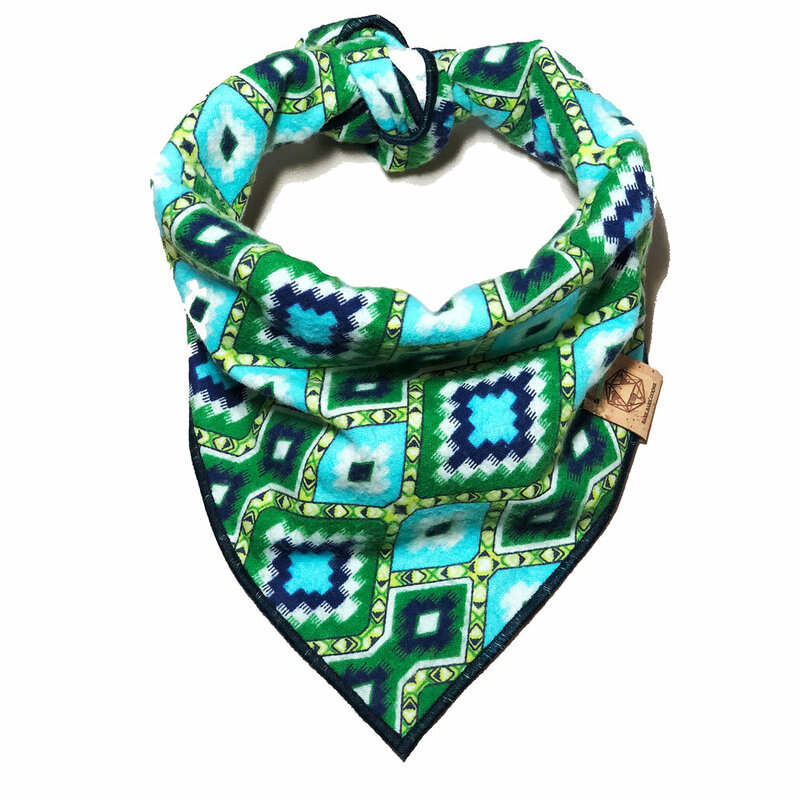 With a refreshing light blue background and green trim, this bandana scream summer! Our ARMADA AZTEC dog bandanas are the perfect season agnostic print. The variety of blues will look great on any dog -- especially those blue-eyed pups! 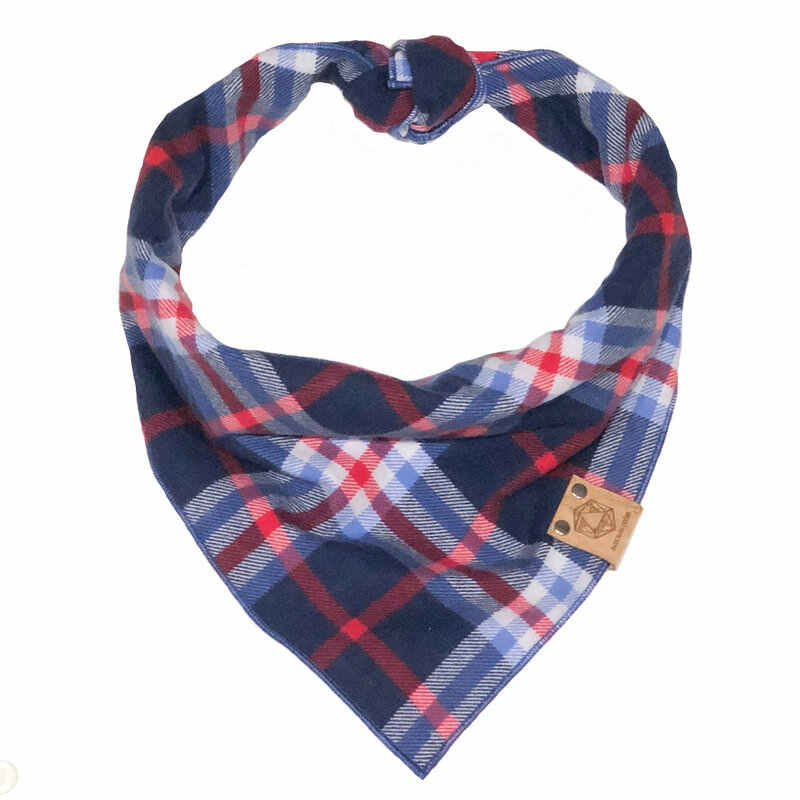 Our SWEET PEA dog bandana is a tartan print that combines navy blue with multiple shades of soft yellow for a chic spring and summer pattern. Our TRICK-OR-TREAT dog bandana is on a soft, grey cotton with pumpkins, skulls, cats, owls, ghosts, and moons! This bandana will make your furry friend look super festive when trick-or-treating with the family this Halloween. Our NEON BATS dog bandanas are perfect for Halloween! 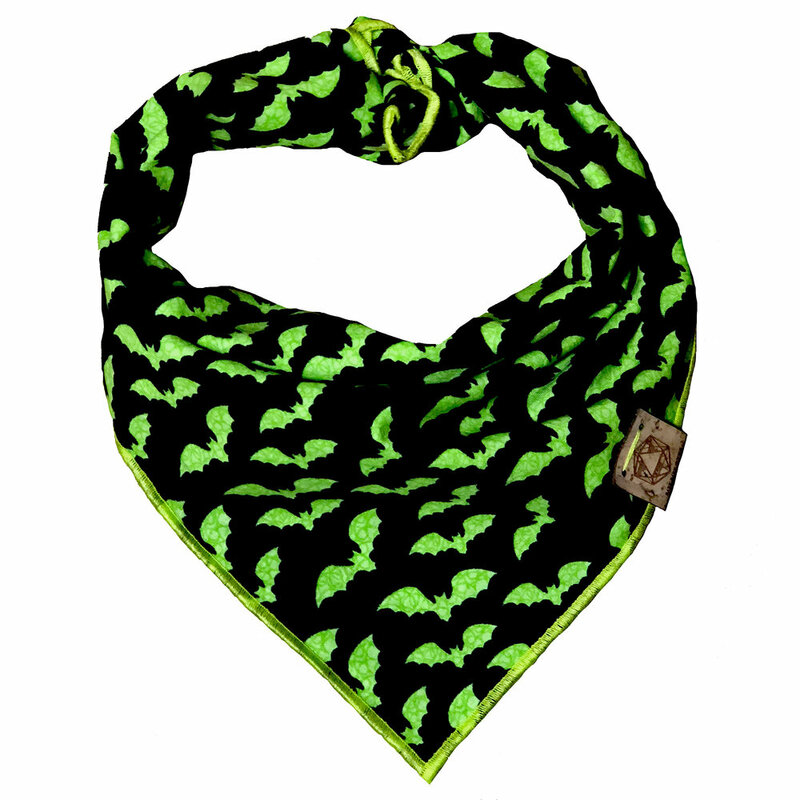 Printed on a soft, black cotton with neon green flying bats, this bandana will make your furry friend look super spooky. BLUE AND GREEN BANDANA -- SOLD OUT! 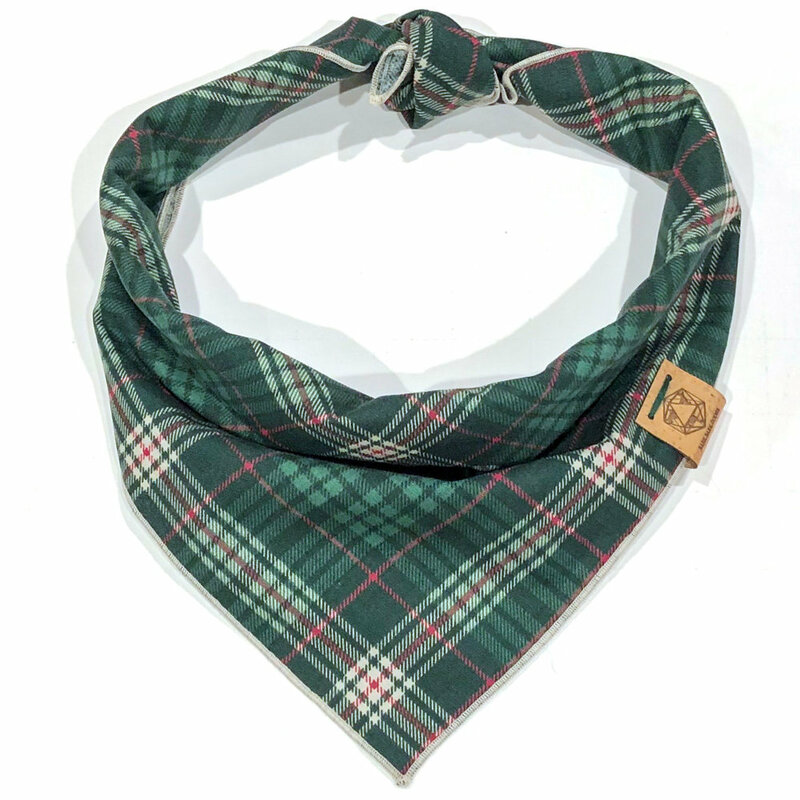 Our BLACK WATCH dog bandana is made with a royal blue and green tartan pattern that is chic yet also traditional. Yellow trim gives a nice pop of color. Our INDIGO dog bandanas have tiny white flowers outlined in black make for a unique floral pattern that is perfect for any season! GREEN CAMO DOG BANDANA - SOLD OUT! Our WOODLAND dog bandanas have a fun green camo print and are perfect for hunting dogs, hiking dogs, and pups who just like nature! Our RAINBOW dog bandana with pink edging is the perfect spring pattern with pops of alllllll the colors. It's everything we need for spring weather. 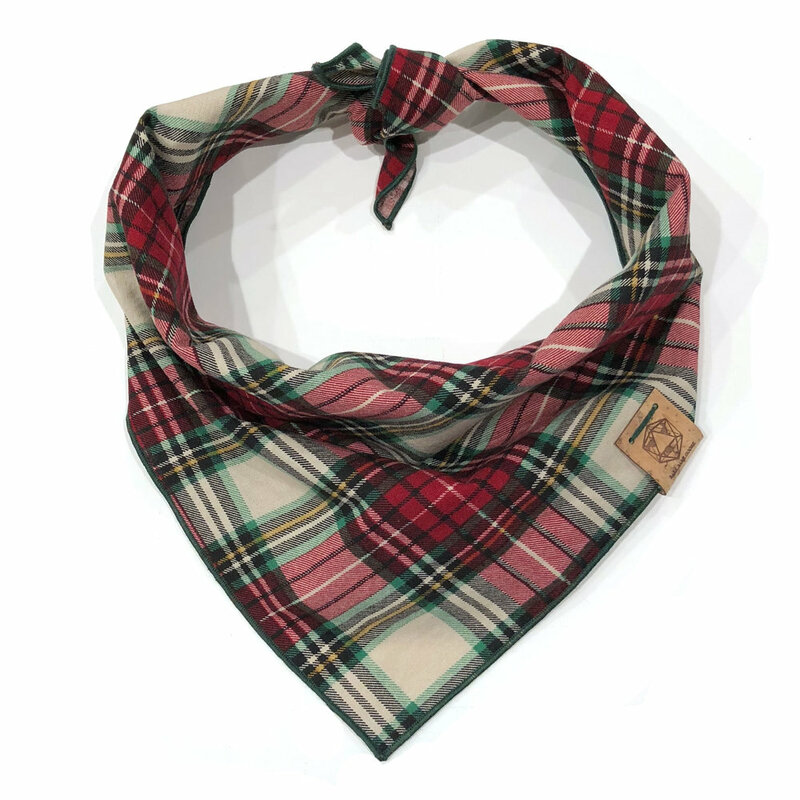 Our HIGHLANDS dog bandana is made with a traditional tartan red, blue, and yellow plaid pattern. Yellow trim really makes the bandana pop. Our PINK BUFFALO dog bandana comes in buffalo check. This pattern has been iconic since 1850 and it's about time your dog was an icon, too! 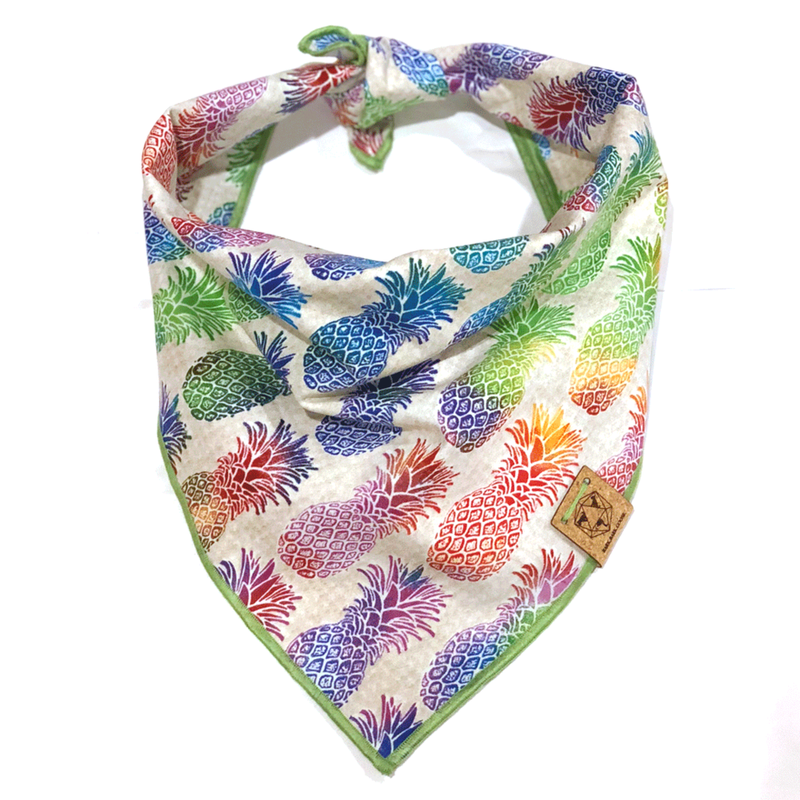 Our FINEAPPLE PINEAPPLE dog bandana is so fun! With rainbow colored fruits in a diagonal pattern, your pup will be prepped for summer fun! 4TH OF JULY DOG BANDANA - SOLD OUT! Our LOVESICK dog bandana has tiny blue arrows set against a bright pink background that create a geometric pattern. Our RAINBOW bandana with yellow edging is finally in stock! You can outfit your pup with this fun chevron pattern for spring! 4TH OF JULY STARS DOG BANDANA - SOLD OUT! 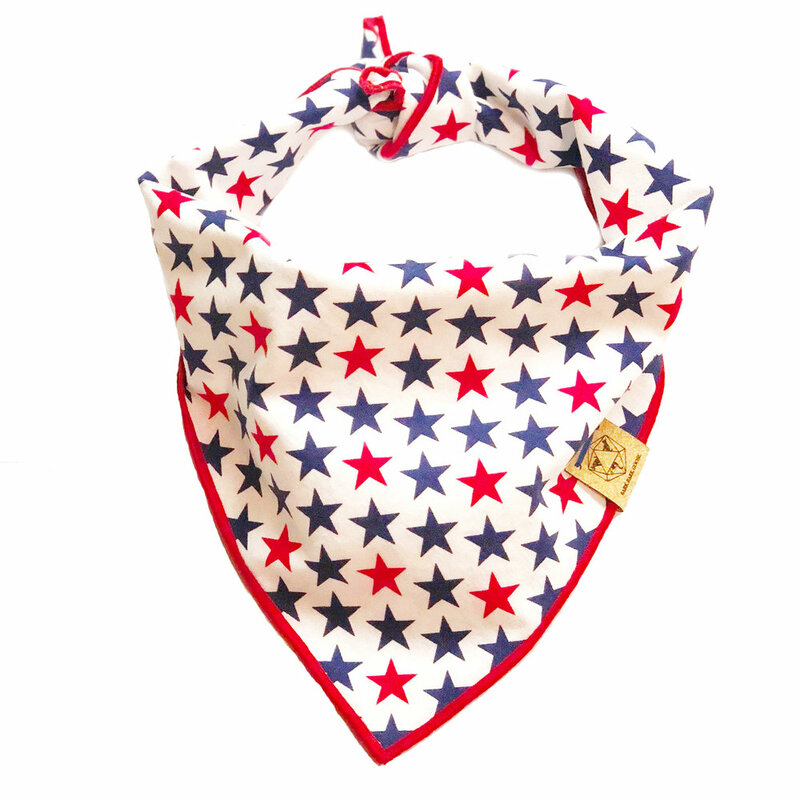 Our STAR SPANGLED dog bandanas are ideal for a backyard barbecue or the Fourth of July! This red, white, and blue pattern says "summer is here!" Bark.Bark.Goose is a participant in the Amazon Services LLC Associates Program, an affiliate advertising program designed to provide a means for us to earn fees by linking to Amazon.com and affiliated sites.